Ford seems like to be all planned to rule the competitive automotive market. The recent release from the company has left behind in competition the powerful models like, Bugatti Veyron and the Ferrari 458 Speciale with its Power per liter delivery. 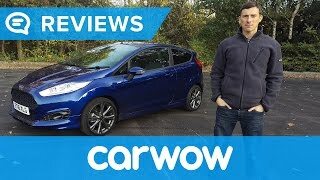 Yes we totally agree to your reaction, it is enthralling and the model here presented by Ford is the Ford Fiesta Zetec S 2015. Company has come up with the two variants in Red and Black edition. Both the variants are just in different with their color contrast while features remain same. Let us have a closer look at this outstanding piece of engineering. 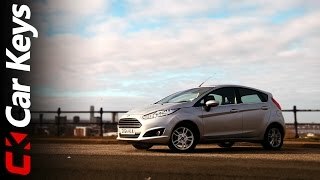 The all new Ford Fiesta Zetec S comes in two twin variants; Red and Black Edition. The impeccable combination of colors in making of the body and coloring the physical features gives it an eye-opening sporty look with desired blend of class. The models in common feature black leather sports steering adding and standing to the marks of its color contrast while the gear lever gaiters with red stitching. The same color contrasting goes through out the models interior. While on one hand they have black floor mats, the red stitching on them add the blend and similarly the black leather seats are contrasting red stitching. The model holds impeccable features from the house of Ford like the Ford SYNC voice activated connectivity system, Active City Stop low-speed collision avoidance system. The models also hold a unique feature MyKey which empowers the parents to put restrictions on young riders ensuring a safer ride for them. 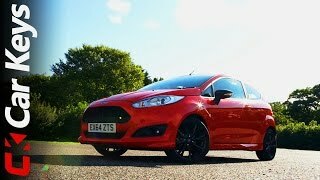 Both the models, Ford Fiesta Zetec S Red and Black Edition are played well with the colors. The Exterior for both these color models commendably catches the eyes while you ride it through the streets. The Black model comes with red roof while the red one with black. 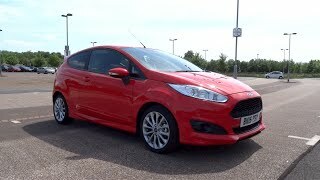 While on one side the Ford Fiesta Zetec S Red Edition looks more for the reserved riders, ‘reserved’ as in those who seek little less attention but can’t compromise with the aggressive looks while the Ford Fiesta Zetec S Black edition gives the high contrast especially around the grille with which you just can’ avoid getting noticed on streets. The models feature standard black 17” alloy wheels. The front and rear sports bumpers, side skirts and the rear roof spoiler adds more of sporty look to the models exterior. For the years 2012 and 2013 the Ford’s 1.0 liter EcoBoost engine has been honored with the tag of International engine of the year. The engine uses twin-independent variable cam timing and high pressure direct-injection technologies and more of such features that combined together make it the most efficient and powerful engine in category. The 140 HP 1.0 liter EcoBoost engine delivers 12% more power than its predecessors 99 HP 1.6 liter and 123 HP 1.0 liter engines. 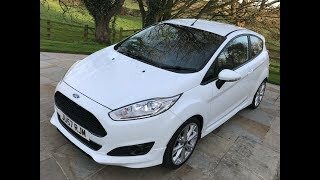 With the mentioned power rolling through the models, Ford Fiesta Zetec S 2015 reaches the top speed of 125 mph (200 km h) and gives the acceleration of 0-62 mph (0-100 km h) in 9 seconds and still very well manages to deliver fuel efficiency of 62.8 mpg with 101gCo2/km emissions.